Kyle is offering this new book as an e-book download for your library. Creativity in the art of magic and entertainment. direct exercises and techniques to allow your own creativity to grow with the magic that you perform. to the magic that they do. Why Ask Yourself Why – Learn key secrets that can immediately be applied to your magic to instantly improve creativity. magicians from being more creative thinkers. Brainstorming Technique That Works – Learn a very powerful brainstorming technique that is simple to use that can instantly allow anyone to think up creative and powerful ideas for their magic. Throw The Directions Away – Find out how to step away from what everyone else is doing and learn to be completely original. thinking and how knowing the difference can impact how creative you really can be. Emotional Response – Learn one of the single most powerful creative tools out there that not many magicians know about or think of using. Learning To See – Find out how to expand your ability to see past the obvious and create ideas beyond your imagination. Creativity Journal – Learn a very powerful creativity tool that can easily have you thinking more creative then ever before and cost you nothing. Resources – A listing of a few very powerful online tools and references that can be used daily. RPM (Reactions Per Minute) – This is an amazing system that gives anyone the ability to immediately measure creativity in any act or routine in a physical format. magic to areas you have never thought possible, then this E-Book is a MUST. "You did an awesome job. I don’t know how many times you've done the lecture, but it came off super professional and polished. I especially like the exercises you did with improvisation. They really illustrated your point and they were so much fun to watch. Are you doing the lecture anywhere else? " "I just got home from my SAM Assembly meeting here in Maryland and we had the good fortune to host a great lecture on creativity by Kyle Peron. Kyle presented a well-paced, very informative, humorous lecture and his passion for magic really showed. Kyle had us do some very funny improv exercises that illustrated his points about creative thinking and thinking on your feet when needed, and also shared some of his material from his family shows. It was an evening well spent and I hope others will get the chance to attend one of their lectures in the future. The encore ebook is is packed with great information taken directly from this lecture and i found it so valuable to me." 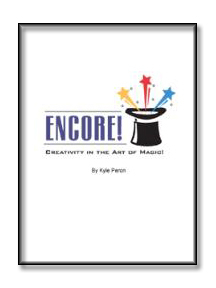 "The Encore ebook from Kyle is not very expensive, but it gives wonderful ideas on how to be creative very quickly in the art of presentation, using you existing act to get it on a higher level, and much more. Very well written with a lot of real world exemples as well." "Thanks to you. Your e-book has just opened another door to me to make magic more creative and so, more entertaining. "Well I finally finished your e-book and I must say wow!!!!! I was charged up by all the new things I learned and re-charged by the reading about the things I knew. I really enjoyed the Learning To See section of the book because that has been something I have been working on personally. I believe you really broke down the brainstorming process so anyone can employ it. I personally find taking long walks and going to the child like place where anything is possible. I just imagine myself on stage doing real magic and sometimes out of that I get an idea. See for me the idea is the hard part but engineered a gimmick to make that idea real is the easy part. You also talk about not reading the directions or viewing all those videos and I cant agree more. I once attended a lecture with Jonathan Pendragon and he talked about not be free creatively till he trashed all his videos of other magicians. He went on to say as magicians we tend to play and re-play videos of other magicians thus programming our subconscious mind. No wonder we cant think outside the box, we cant see what's beyond it. After the lecture I trashed all mine as well. Again, great job on the book and thank you for sharing your ideas with me.